Rolls-Royce continues to use its signature design elements on the Dawn that makes it a stellar looking convertible. The chrome grille sits higher than the one on the Wraith, while there are sleek headlamps with projector lights and smart daytime running lights surrounding it. There is a strip sequence LED lights just below the headlamp cluster and a large, brawny front bumper graces the front housing the big air intakes and a central air dam. The bonnet has been slightly redesigned, but continues to hold the iconic – Spirit of Ecstasy. The stylish 2+2 seater soft top convertible shares underpinnings with the Wraith coupe, but is claimed to be an entirely different car with its own unique styling and features. It is the fourth Rolls-Royce model to enter the Indian car market after the Phantom, Ghost, and Wraith. Though most convertible versions of existing coupes are identical from the waist down, the Dawn’s design has plenty of features to set it appart from the Wraith. It might not seem like it at first glance, but Rolls-Royce says that nearly 80 percent of the Dawn’s body panels are new. 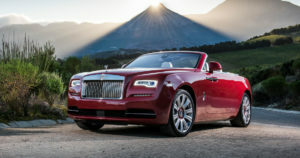 This explains why the Brits decided to go with a separate name rather than Wraith Drophead Coupe, the moniker I initially thought it will receive.While the “80 percent” bit seems like a lot of PR talk when comparing the two — the body panels aren’t that different in terms of shape and size — there a few details that set the Dawn and the Wraith apart. First, the headlamps have a different shape. Second, the grille was recessed by nearly 1.7 inches, while the bumper extended 2.1 inches, making for a longer front overhang. The 2016 Rolls-Royce Dawn is one of the most exquisitely detailed vehicles we’ve ever seen. The stunning wood trim that wraps around the entirety of the cabin (as well as the cover that hides the retracted soft top) is also used straight down the center, so the detailing in each half of the cabin is perfectly mirrored on the other side. The butter-soft leather seating surfaces and rich lambswool floormats are magnificent indulgences that are befitting a car of this price. Because of the company’s association with BMW, much of the infotainment and navigation electronics are derivative of the generally impressive and user-friendly iDrive interface. However, in the Dawn, the substantial glass central controller, fittingly adorned with a Spirit of Ecstasy inlay, effectively operates through a uniquely British interpretation of this now-familiar system including multilevel menus and a high-resolution display. Even the car’s reminder chime has been replaced with the sound of a harp strum. Compared to Rolls-Royce’s sedan offerings, Dawn buyers are more likely to drive themselves than be chauffeured. Even so, Rolls designed its new convertible with rear occupants in mind, claiming that there’s enough room to sit four adults comfortably. You might also appreciate the fact that the front seat belts are integrated directly into the seats themselves. Not only does this allow the leather and wood door trim to continue uninterrupted through the cabin, but rear passengers don’t have to crawl under an impeding seat belt to exit the Dawn gracefully. A casualty of this passenger-centric design is trunk space, which has shrunk from 16.6 cubic feet in the Wraith to 10.4 cubic feet in the Dawn (or 8.8 cubes with the top lowered). Since you’re driving them in style, your passengers will have to do you the favor of packing light. The 6.6-litre twin-turbo V12 will soon have to make way for greener powertrains  could be smaller engines, could be alternative powertrains. But at the moment it continues to serve the Dawn. It is tuned a bit differently to the Wraith. Shelling out 570PS of power and 780Nm of torque, its character has been altered to suit a more relaxed drive. It feels less eager and responsive than the Wraith and loses out to the coupe by about half a second in reaching the ton. In fact it feels quite similar to the Ghost’s state of tune. The accelerator pedal has been remapped to increase response in the mid-range instead of the low-end. The ever faithful 8-Speed ZF gearbox still does duty very ably and it suits the driving characteristics of the Dawn. It also borrows the Satellite Aided Transmission system that debuted on the Wraith which gives the gearbox a GPS based intuition that easily trumps human judgment. It essentially anticipates the road conditions ahead, gauges your driving style and preps the gearbox for changes accordingly. You don’t drive a Rolls-Royce, you experience it. It’s claimed to be the world’s stiffest four-seater convertible, and certainly feels very un-tremulous. It’s wider but shorter than the Ghost, with a lower centre of gravity, and has reworked suspension with active anti-roll bars. While it’s still not a car you’d be naturally inclined to hustle, if you do give it the hurry-up the Dawn disguises its weight and handles with amazing alacrity. Rather than steering with your fingertips, you engage with the Dawn.The engine is the same silken twin-turbo 6.6-litre 563bhp V12 the Ghost uses: the feeling of gathering momentum is similar to the one you experience in an Airbus A380 on take-off, yet the Power Reserve dial is a reminder you’re using only six or seven per cent of what’s available. It’s also stunningly refined. The car comes equipped with ventilated disc brakes at the front as well as the back. ABS and airbags are offered among other safety and driver assistance features like lane departure warning, cruise control, night vision camera, emergency brake assist, dynamic stability control etc.